Start your journey in De Pere, a city that just can’t seem to let go of its heritage, no matter how hard it is for Siri to understand where you are trying to go. Our official address is 101 James Street in De Pere. If you are looking for us on Google Maps, don’t let your GPS take you to James St in Green Bay – We won’t be there! Make sure it says De Pere! Most cruises – both Public and Group Tours – are 1 1/2 hours – the perfect amount of time to relax but not get bored. When we go through the locks, though, the cruise is 2 hours so that you still get enough river time. The lock thru experience adds it’s own unique entertainment! Private Chartres are 2 or 3 hours, or more if you want to add on! We will go all day ……..
Goooooood question – if you have read this far, you deserve to know the whole truth. Our Coast Guard Certificate of Inspection allows 49 paying passengers. We state 49 passengers as the maximum on each of our cruises. But it seems like quite often, when we are fully booked, people ask – could you please fit the 2 of us on this cruise, we really want to go …… and we really want to say yes, but we have given our word to the Coast Guard, and so we must say no ….. sorry! Again, our Coast Guard Certificate of Inspection allows 24 passengers up top at one time. This number has no fudge factor in it – 24 is the max (unless we have a lot of little munchkins on board with their parents — they weigh a lot less — but that is the Captain’s call). I guess that sounded like a fudge factor, hey? Please arrive about 10-15 minutes before the cruise. That will allow plenty of time to check in and get a seat. If you come earlier than that, you will be watching us getting the boat ready – vacuuming, stocking the bar, bringing on ice – all very exciting! Parking is directly across the street from the dock – we are so fortunate and grateful for that City lot. It is open to the public, is free, and has no time limit. No worries at all —- except for Thursdays when the Farmer’s Market takes over the lot. It means you’ll have to go just under the bridge to find additional parking, but it also means there are more things to do while you are waiting! We have a Ticket Booth!! This is where you will check in and where you will leave your troubles. Once you park, you’ll see us – promise! Yes it is! We researched and searched until we found the perfect ramp to help get people of any ability from the dock to the boat and back out again. The ramp is stable and we will have plenty of staff on hand to help you, if you need it. Upstairs is another matter though – because the only way to get there is to ….. go up stairs. See our Photo page for a video of the ramp. Yes we do! As fine a restroom as you are able to find on a 1953 boat anywhere! Nope …………….. oh, you probably would like a reason why …….. because we want to sell you ours! 🙂 Also, the health department and liquor licensing agency have strict codes that we must follow for all food and beverages. We need to supply them all. On Public Cruises, there is bar mix available and sometimes light appetizers. There is a full bar on board that offers water, soda, juice & alcohol of almost any variety. If you book a Group Tour or a Private Charter however, you may choose to have appetizers, boxed meals, or plated meals. Again, we will work with you at every turn to get you what you want – if it is within our power. We also travel down-stream – bet you can guess which way that means (come on, give it a try) – and this cruise varies depending on the day. This way is more urban and industrial. There are different places to stop, different things to see, the only guarantee is that we will go through the De Pere lock. Not just once, but twice. Very cool experience in and of itself! You are about to board a well traveled vessel! She was built as a one-of-a-kind in 1953 in Jeffersonville, Indiana and operated as a tour boat under the name Miss Green River on the Green River running thru Mammoth Cave National Park in Kentucky, while owned by M.E. Nash. Then she was owned by Pete & Mike Hoseman while under the name Sea Witch on the Tennessee River in Chattanooga & the Mississippi River in Vicksburg. In 1986 she was moved to Sodus Point, New York, and operated on Sodus Bay off the south shore of Lake Ontario by the Arney Family. She was renamed Rose Lummis after Madame Rose Lummis, a prominent Sodus Point Catholic missionary in the mid 19th century who was known as the woman “who did the work of eleven priests”. In 2001 she was purchased by Captain John Cooper who completed major renovation work including the completion of the upper observation deck. Captain John kept the name Rose Lummis and ran tours in Sodus Bay. Later, he moved the tour to Spencerport, New York where it operated on the Erie Canal and Geneva, New York, and then finally he offered tours of Seneca Lake. In October 2015, after an extensive countrywide search, she was purchased by Fox River Tours. 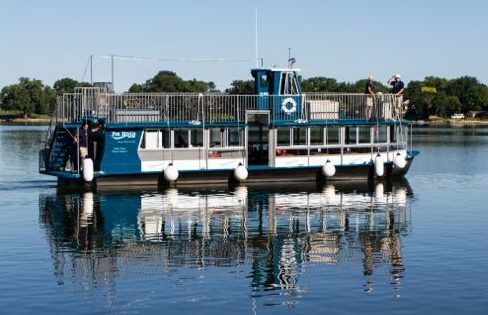 Hauled by truck for 845 miles to the shores of the Fox River, she underwent extensive renovations during the winter/spring of 2016 and began tours of the Fox River in May 2016.